I've spent the last four days in Las Vegas teaching at the Inspiration Unlimited event. I cannot say enough how much I enjoyed teaching! Most students were open to trying the mixed media techniques and that made me super happy! You never know how people will respond to your ideas but everyone seemed happy and grateful for the kit and the giveaways that Tim sent. Also a HUGE Thank You to my two personal assistants Susan and Julie. They were with me in all three classes and did an amazing job assisting students and moving all my products/kits between classrooms. It was like a well oiled machine. THANK YOU to Tim, Advantus, Ranger and Stampers Anonymous for sponsoring my class! Always, always so generous to the students. Now to play a little catch up with the groceries and laundry (and Project Runway). Oh, and all the boxes of product that were delivered while I was away....gotta get to opening them up since it is the product for my classes in Waxahachie, TX on Oct 17th and 18th that needs to be kitted sometime in the next week. Looks like I will be busy, busy, busy. Today I have 10 inspiring projects from around the web to share. I know I get inspired by what others create and each of these projects include a clever idea or technique that I was inspired by. I hope you will pop by their blogs to see more of what they have created. Love the jumbo tag by Barbara! She created a great background with one of the new layering stencils and texture paste. I also love that she went with non traditional colors for this tag! 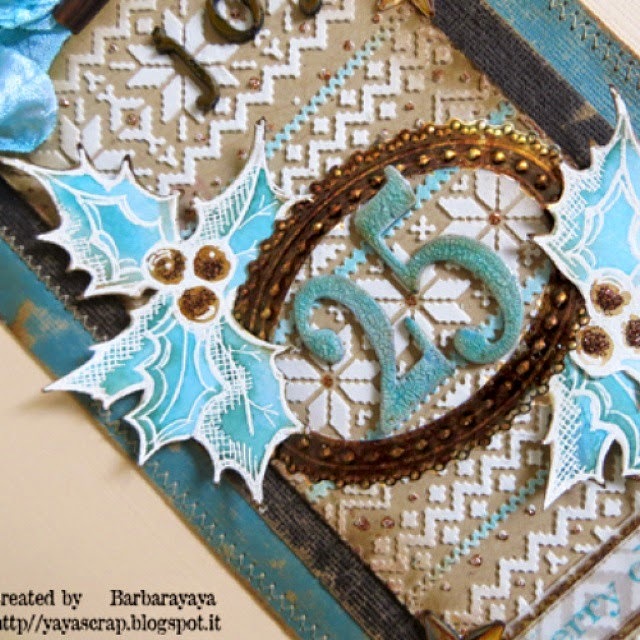 When you see the up close pictures of the tag on her blog, the 25 is so beautifully done in crackle finish. You may have to hit the translate button to read her blog, but it's worth it. This is one of my favorite fall card projects - so simple but incredibly beautiful. Love the touch of gold on the clock face and the stunning background. Jenny created this for the CC3 challenge - on embossing powders so you can guess what she used to create the wood grain background. No one does Halloween like Shelly does Halloween. Her Halloween Configurations Book from 2013 is still one of the best Configurations projects I have ever seen. This Found Relative project is no exception. From the clock in the background with the subtle spiderweb and orange glittered hands to the bat on a string. Pure Shelly. I sure hope there is more to come this month! 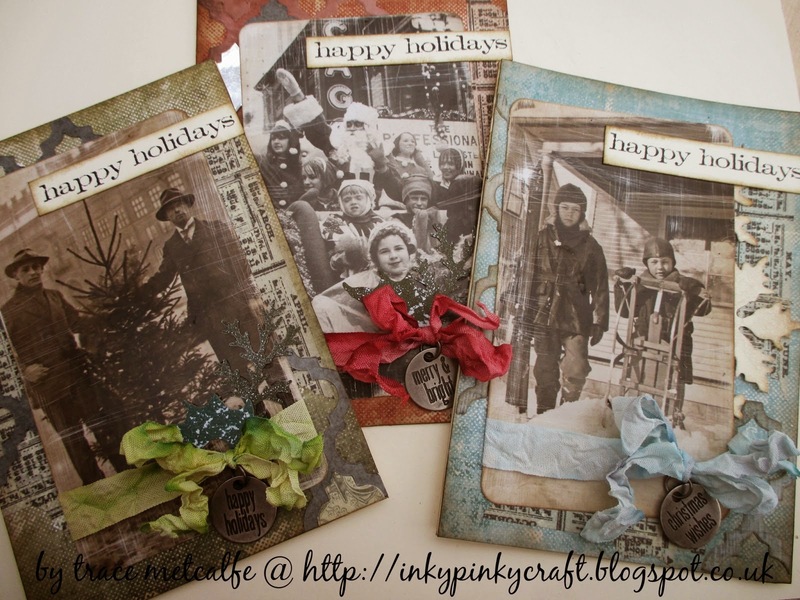 I love the idea of using the new "Occasions" - Found Relatives to create Christmas Cards. Trace shows all the background details in her post so I hope you will pop over to see the cards up close. What a great idea! 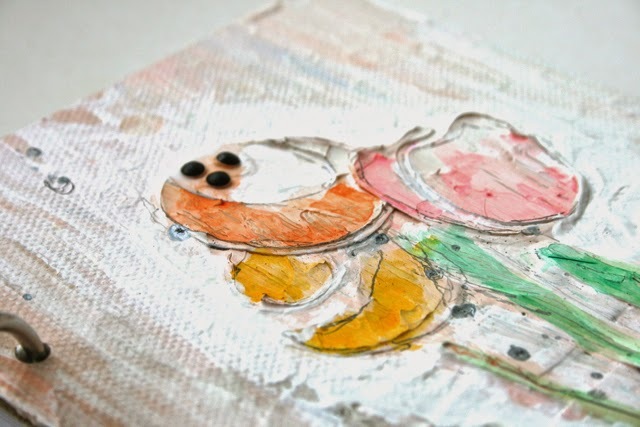 This simple birthday card by Anja is wonderful. Simple and perfect for a birthday! I love how she cut the birthday cupcake blueprint image into a circle. One of those "wish I would have thought of that" moments. 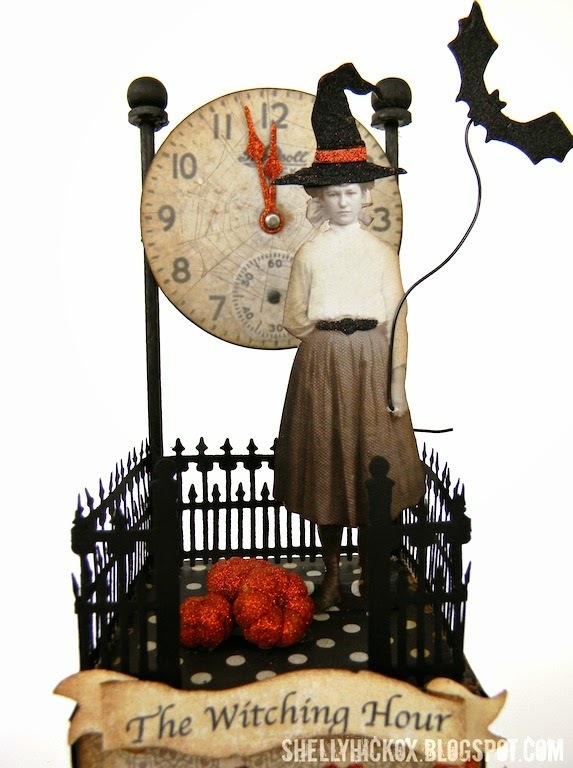 Halloween tag - LOVE the background Bobbie created with Distress Ink and Paint and the Shatter Layering Stencil. WOW. 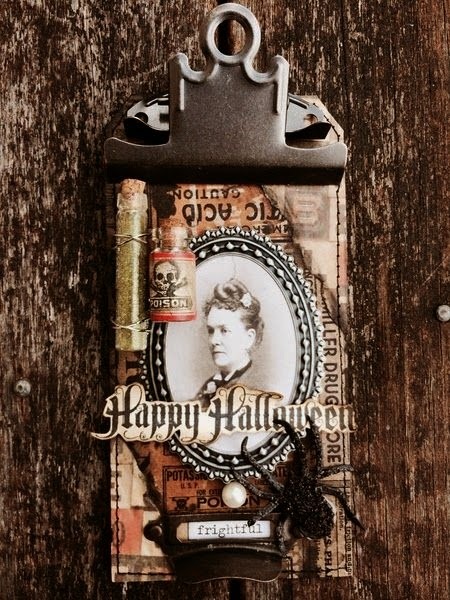 Halloween Tag - This tag just makes me happy - the Corked Vials, the spider and the Clipboard Clip...everything works together to create a great Halloween collage. Karen has a tutorial showing how she created the tag background too. Love it. I saw this project last week and could not stop thinking about the color that was used here. I love how Andrea used the picture wheel die on the Worn Cover and then went on to add all the pages inside that represent the colors of Distress products. Total color inspiration! When I saw this journal cover by Ashli I could not figure out how she did it. Can you? Check out her blog for the answer. I will tell you I would have never thought to even try this, so props to Ashli for being so dang clever. This is definitely something I want to try. 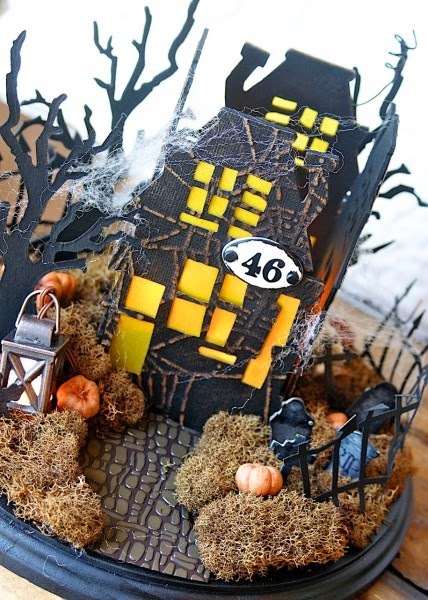 And the last one for the day is this amazing Halloween centerpiece by Hilary. I shared this on Facebook but I had to share it again here. I wish I had the time to recreate this for my house this month!! I love everything about it, from the yellow windows to the little pumpkins, right down to the cobblestone street! AMAZING idea and craftsmanship by Hilary Kanwischer. Maybe I can start in Jan of 2015 I can get one done by next Oct! Thanks for sharing all these treasures Paula! Wow! Great projects and wonderful inspiration. Thanks! Great creations up there! Thanks for sharing them, Paula. So many lovely projects and creative women! Thanks for the inspiration, Paula. Wow -everything is so creative. I'm definitely going to check out all of their blogs. Thanks for showing these beautiful works of art. There are truly so wonderfully creative people out there! I'm blown away. Inspiration galore! Thanks for sharing Paula and welcome home! Thanks so much for sharing my project, Paula! And what an amazing roundup of projects by some of my favorite artists. Tons of inspiration for sure! The class, products and giveaways were super generous and amazing! Thank You! I loved taking a class from you and those memories will be in my heart forever! Thanks again and cannot wait to take another class from you! It is wonderful to see so much inspiration in one place! Thanks so much for sharing Paula. WOW Awesome projects ... great share ! I see the inspiration, they sure inspired me, I have to admit that the Color Book is my absolute favorite, I loved all the art but the color book makes me want to sit down and start creating one of my very own :) Thanks for taking the time to accumulate all the inspiration and thanks so very much to each and every artist your art is inspiring!! Great share and you certainly picked some worthy projects! Fabulous inspiring pieces! Thank you for sharing Paula! Paula you were the highlight of my IU! You are an amazing teacher. I love love love my canvas. It is beautiful and proudly displayed with a vintage picture of my grandparents, mom and aunt! Thank you! Thank you for sharing those beautiful pieces, Paula! Awesome projects and inspiration! Thanks for sharing! Just popped over from Jenny's blog to have a peep and glad I did. So much inspiration in one place ... fantastic.